The economy is more vulnerable than it seems right now. Unfortunately, health care inflation driven in part by the cost-control flaws in Obamacare is about to make it worse. U.S. GDP growth has been chugging along near stall speed, with first-half growth clocking in at just 1.25 percent and Q3 growth expected to be 2.1 percent according to the Atlanta Fed’s final estimate before the official advance figure is released on Friday. Economic activity outside of consumer spending is "essentially in recession," according to Deutsche Bank economist Joseph LaVorgna. The outlook for the rest of the year and 2017 depends on continued strength in the labor market driving wage gains and consumer confidence. 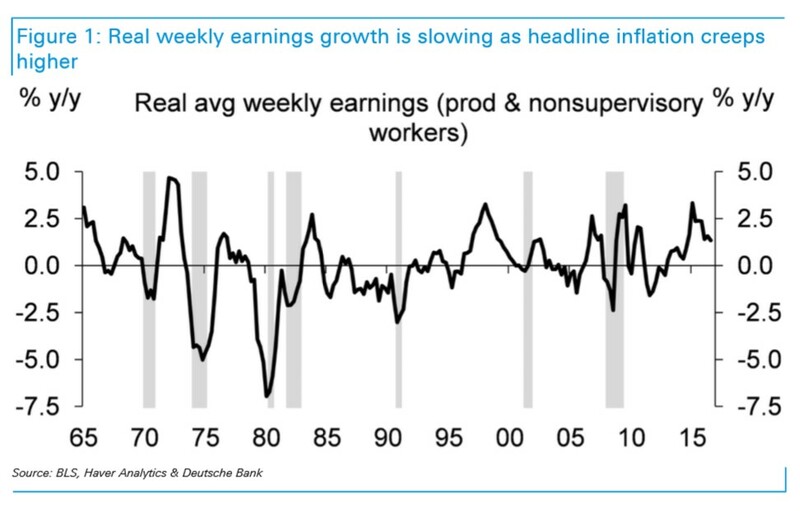 Already, we’re seeing signs that rising inflation mixed with unimpressive wage gains are beginning to pinch real incomes. Gasoline prices are up by two-thirds since February and by 20 percent since September. Obamacare enrollment is going to make it worse. On Monday, the Department of Health and Human Services announced that the cost for a health insurance plan obtained through exchanges set up under the Affordable Care Act would increase 25 percent on average for the 2017 coverage year. The increases will vary heavily by state, with Indiana and Massachusetts seeing an average decline of 3 percent while Arizona residents will suffer a 116 percent average increase. Supporters of the health care reform law defend the increases by contending that the vast majority of marketplace enrollees — almost 85 percent, according to the government — are eligible for tax credits to offset the costs and that the increases are in states that haven't expanded Medicaid coverage. Some opponents warn that the price increases will only further force healthy, young, low-cost patients out of the system, further pushing up insurance costs for those who remain, precipitating further premium hikes and throwing the entire law into a death spiral. All of this has attracted political attention, with topics like drug price increases (looking at you, Mylan (MYL)) and higher insurance premiums, co-pays and deductibles being discussed by the presidential candidates. Whatever your political leanings, the sad fact is that the health care system remains broken and is now threatening an increasingly fragile economy that is relying solely on the willingness of consumers to spend. While Obamacare expanded coverage to millions of Americans, it has done little to address runaway cost inflation in the health care system. LaVorgna believes a slowdown in consumer spending should be reflected in the initial third-quarter GDP report. 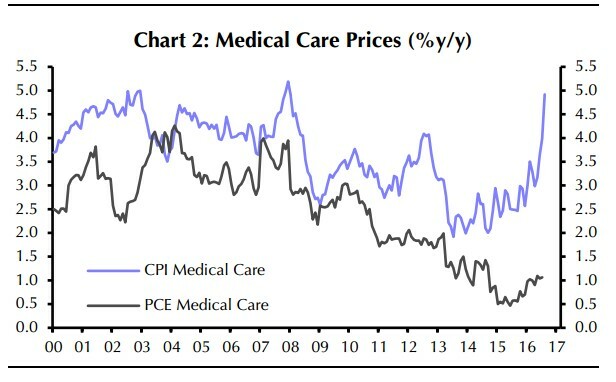 Capital Economics notes an "alarming" surge in medical cost inflation as measured in the Consumer Price Index, as shown above. Another measure of these costs preferred by the Federal Reserve doesn’t reflect the same surge as it includes declines in administered prices set by Congress for Medicare and Medicaid. But the CPI measure covers only households' out-of-pocket spending and thus should more accurately affect the impact health inflation has on consumer purchasing power. As inflation rises, the real purchasing power of household incomes decline. As more and more money is spent on insurance premiums and out-of-pocket care, less is available to buy smartwatches, smartphones, fast-food burritos and the like. No wonder that several consumer-focused stocks reported tepid results and guidance this week, including appliance maker Whirlpool (WHR). We'll know more about how badly Obamacare and health inflation is weighing on the consumer when Q3 GDP numbers are released Friday morning.